I have done some reading and it is my understanding that the old Vaq can withstand the pressure of hot loads wear the New Vaq style will not. How true is this. I like the Ruger but if the New Vaq can not withstand hot loads I need to look for the old style. I want to be able to shoot all loads out of the pistols. You won't live long enough to wear either type out. I use .44 mag OMV's as a SD in SASS. Depends on the caliber. in the .45 hot loads are verboten in the smaller frame, due to the strength of the cylinder I believe, the .357 in both sizes will shoot all sane loads.. I shoot OMVs in 45LC. I also use it as my carry gun in the woods loaded up with 300 grain slugs loaded to the max. It is no fun to shoot with these loads but it will do the job. I will not comment on the NMV. OMVs and NMs have the same grip frame size. It's the frame and bbl that are smaller on the NM. I am looking for more than just CAS, looking at the 45LC. Take into the woods as a back up to a rifle, etc.... Was wondering about the bisley also. I do have big hands and long fingers. As above mentioned might have to stick with the Vaq. Then why won't grips from the old model fit the new model? The original vaquero is wider in the palm area and fits my hand, the new Vaquero not so much ....at all! If you're looking to use it for more than CAS, definitely get the old model Vaqueros. As for Bisleys (and they do fit larger hands better for many), be aware that Ruger has done a run of Bisley Vaqueros in 45 colt recently with the SMALLER new Vaquero frame. The way to tell is the serial number. A two digit prefix denotes an old (bigger) model; a three digit prefix is a new (smaller) model. They will, if you re-drill the locating pin hole in the bottom corner of the grip. The New Vaquero has the XR3 style grip frame and the Vaquero has the XR3-RED style. The XR3s were the type on the pre-1962 Blackhawks and Single Sixes. Grip has a straight back and is 1/4" less room between trigger guard and frame. The Vaquero, which is on the large frame, in 45 Colt will handle Ruger only loads and the New Vaquero which is on the mid size frame will not. OLD WEST FEEL AND HANDLING with the pre-1962 "XR-3" style, steel grip frame and black checkered grip panels. I will double check with my OMV .44s and my wife's NM in the morning. Two different guns, OMV vs. NMV. NMV has the feel of a SAA and reflects that in the lack of heft. OMV can handle whatever you feel brave enough to feed them. For CAS I use NMV and for a woods gun, OMV in .44 mag and .45 Colt. Grips for the newer won't fit the older. There really is right on about 1/10" difference where the grip frame meets the back of the revolver frame. You can fit a left panel from one to the right panel of the other and they line up except for that extra on the old one. The escutcheons come very close to lining up. The locating pin holes differ about 1/4". You can cut down old grips to fit. Only one cut is needed along with moving the locating pin hole. I'd post a picture if this forum had that capability. BTW, a couple of different sets of grips for the New grips had locating pin holes that were not located properly at all. I assume that Ruger has moved the location of the locating pin on frames without the internal lock (as pictured in their advertising) on the newer frame that does not have that lock. The Original question is . Will the Old model Vaquero's with stand Higher Pressers than the NM Vaquero's. The old model vaquero is built on the Supper Blackhawk size frame . The new Model vaquero is built on the Old Blackhawk 357 frame . Some the hot loads 45's & 44's will harm the gun if not blow it up. When Sturm Ruger first built the 44 mag Blackhawks in 1956 . They used the Blackhawk flat top frames . They then switched to the new supper Blackhawk frame and the problem stopped. So if you are asking for hot loads to hunt with or just shooting of hot loads. You will need a Old Model Vaquero. How about learning to read the articles that are well founded in the science of ballistics and written by well-respected authors, so that you don't have to feel like you can't trust what you have just read? 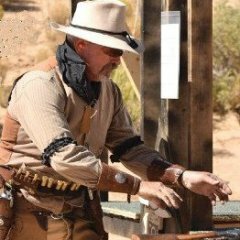 Almost any reloading manual will list a separate class of loads in .45 Colt for the old Vaqueros, loads that just are not safe in the Single Action Army and the new model Vaqueros. That's one reason that the new Vaqueros are never chambered in .44 Mag. Can you shoot ANY load in those old models? No, there are still loads which you could assemble that can blow them up. Called way over pressure loads. But any reasonable load, even exceeding SAAMI specs for standard .45 Colt loads, the old Vaqueros can certainly handle. As Clint Eastwood might say today, "a man's got to know his gun's limitations." The term "hot loads" is vague and has different meanings for shooters. For us to give you good feedback you need to tell us what kind of "hot loads" you plan on using and how steady of a diet you will be feeding it. I have reached the age in my life where I agree with John Taffin that loads around 1,200 fps meet, save CAS, most of my needs. With the 45 Colt I am happy with it's original 19th and early 20th magnum velocity. In general terms though I can't recall the terms weak gun and Ruger used in the same sentence. I have small hands and I love "original" Vaqueros. During the first 14 years I shot Cowboy Action club matches I used a pair of "original" .44 magnum Vaqueros, then I met a beautiful woman who later became my wife. She became interested in Cowboy Action and wanted to start shooting, so I bought her a pair of "original" .357 Vaqueros. Frankly about 3 years ago I got tired of reloading 2 calibers, so I went out and bought a pair of SASS .357 NM Vaqueros. I had problems with proper cylinder rotation and had to replace the Trigger & Cylinder Latch Pivot, the trigger spring, the main spring and the cylinder latch spring until every thing worked as Bill Ruger intended. I hated the guns, far to light. So I suggested to my beloved that we swap guns. Not likely she said. On with the search for 2 more "original" Vaqueros, which in 2012 is getting harder to find. I finally found a pair last February, took them out and sighted them in with the careful use of a flat file. All is good with the world. Now to get rid of the SASS Vaqueros. I casually mentioned to my wife that her brother was going to start shooting Cowboy action so maybe he would be interested in them. "Not until I try them", she said. Next time she went to the range she tried the SASS Vaqueros and looked at me and said that they were her new guns and I could have hers! I dropped my jaw and said you could have told me that before I had to spend $1,200.00 on another pair of "original" Vaqueros. I think the moral of the story is "When momma is happy, everyone is happy", and I do have a set of "original .357 Vaqueros to shoot with now. The newer version has a "thicker" cylinder, the part that blows first. Rough measurement of my new and old versions shows the diameter difference is in the neighborhood of .05+ inches. The more important detail is the cylinder wall thickness at the thinnest point. The new cylinders give away about .015 inches at that point. At least comparing one of my new ones to one of my old ones gives that result. That doesn't say anything about the difference in strengths, but is enough to make me believe the newer versions should be treated as weaker. A grip panel from my OMV can be fitted to a NM by removing about .100 from the front edge(forward of the medallion)and a redrill of the locating pin hole in the lower part of the panel. The back strap profile/outline of the OMV panel matched our NM grip frame perfectly. These NM .357s have a serial prefix # 510. Yes, a OMV grip panel can be fitted to our NM. But it will no longer fit the OMV, after the mods. Ya might want to notice the NMV/Old XR-3 grip frame does not have the kick out on the back side of the frame as the XR3-REDS have on the Vaquero. The XR3-RED came out in 1963, when the Flattops went away and were replaced by the Protected sight guns. 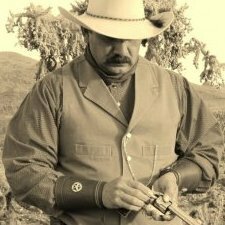 All the Ruger Revolvers at that time except the Super Blackhawk which has the Dragoon style Grip frame had the XR3-RED along with the Vaqueros. The RED in the description stands for redesigned. Lumpy, the idea wasn't to prove anyone wrong, but to make sure readers had correct info. The thing that struck me about the change to the new grip frame was how hard it was to describe the changes. I was shopping for replacement grips for my new Vaqueros and wound up with a couple of pair that were advertised (and marked on the packages they came in) as "made for the new" versions. They didn't fit. Talking to the grip makers was frustrating because they said they had official Ruger frames. So did I, of course. There obviously has been some jacking around about the grip frames. The Ruger booklet and a bunch of their advertising show the grip frames having a big internal lock built in. My pistols don't have the lock, and don't appear to have a place for one to be installed. They're castings of course. Castings are great for cutting the cost of machining for things that have to be installed like locks. So it wasn't a minor deal that Ruger changed the castings. And not surprising the locating pins may (or may not) be in a slightly new location. It'd be nice to hear from someone who actually bought a new one with that internal lock that's in all Ruger's pictures, just to know that they actually made them. Or hear the story behind those pictures. When you say 'kickout'. Is that the 'flare' at the bottom rear corner of the grip frame? My OMV grip matched all of the NM gripframe profile except as I noted. There were no gaps etc. Our NMs, HAD that lock. Those locks are now gone. Bet you use an "X", just like when you sign your name. I have 2 of the new Vaqueros with the internal locks in the grip frame. I purchased them when Ruger first put them on the market. I was not aware they had changed anything with the new Vaqueros. You have to remove the grip panel to gain access to the locks, or drill them to use the key without removing the panel. Instructions are in the owners manual to drill the hole for that feature. Thanks MM, It appears their makeover included the lock for reasons they no longer care about. And they just haven't bothered to update their advertising or the booklet that comes with the pistol. Thanks for the answer. That is really interesting info, but it appears they missed the change Ruger made to the New frame when they redesigned it to delete that internal lock. It appears the locator pin moved at the very least. When I bought my two new New Vaqueros recently, I ordered replacement grips that were advertised for the New model. They didn't fit my New models. I couldn't tell for sure if the outline matched or not because the pin was so far out from fitting. I called the mfg and got a very helpful woman who said she'd check and call me back. A day or so later I ordered a pair from another mfg. A day or so later I got a call from the 1st mfg who said I should send them back and they'd send ones that fit. I didn't know to ask anything at all. The 2nd order showed up the same day the replaced ones did. Locator pin holes didn't match up. The 1st set now fit. Comparing the 2 new sets with the original and all those to old version originals showed almost identical outlines and 3 different locator pin locations. Neither of the 2 new replacement grip sets' locator pin locations match each other or the old version locator pin locations. The only thing that comes close to making sense to me is that Ruger appears to have moved the locator pin location when they quit making New model frames with the internal lock. They didn't move it very far, but some of the replacement grips I've gotten for New models won't go on at all. Could be sloppy work of the after market mfgs, however. Confusing... for sure. Thanks for all the info. Not sure if I will be shooting hot loads or just regular loads, even store bought until I get better at reloading. I think the new Vaq will handle mostly everything I use. Have to wait and see. Grips from the older model need more than just relocating the pin hole in order to fit the new model. Their outline does not match the outline of the newer model along the shortest side. The old grips are about 1/10" longer than the new ones in front of the Ruger "medallion". There are two jobs needed to get old grips to fit new models: cutting that excess off the older grips, and moving the locator hole to suit.